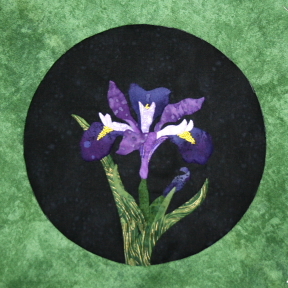 just a quickie here, to post the picture of the finished ‘baby’ iris. have much work to do today to be ready for tomorrow. the paper white pattern is going to the printer today, along with this iris one – so i really need to finish that sample as well. and the list i am looking at has several more items that must be completed by 12:30 tomorrow when i pick up erv and head on down the road!